1750 - James Parker, a former printing apprentice to Benjamin Franklin who with Franklin's financial support had established a successful printing business in Manhattan, returns to New Jersey to set up a printing business in Woodbridge. He soon becomes the official printer for the colony, printing its currency, legal notices and legislation, as well as being appointed the comptroller of the general post offices ot the British Colonies and judge of the court of Common Pleas of Middlesex County. 1754 - John Woolman, a Quaker tailor and itinerant preacher from Mount Holly, publishes Considerations on the Keeping of Negroes, one of a series of writings arguing for the abolition of slavery. 1755 - New Jersey Provincial Assembly orders enlistment of 500 men, later known as the "Jersey Blues" due to their uniform color, to deploy on the New York frontier and the Delaware River to resist Indian raids by tribes allied with the French during the French and Indian War. 1758 - The Old Barracks in Trenton is built as quarters for about 300 British and Irish soldiers during the French and Indian War. - Presbyterian minister and theologian John Witherspoon emigrates from Scotland to be installed as sixth president of College of New Jersey, later becomes a leading advocate of independence and elected as delegate to Continental Congress who signs the Declaration of Independence. - Brotherton, the first Native American reservation in America, is established in Burlington County at present day Indian Mills, Shamong Township, after legislation is passed by the legislature to purchase the land. Led by the Reverend John Brainerd, a missionary, the reservation is settled by approximately 200 Native Americans working at grist- and sawmills. The reservation continues until 1802, when many residents accept an invitation by Oneidas to relocate and live with them in New York State. 1763 - William Franklin, the illegitimate son of Benjamin Franklin, is appointed, with help of his father's influence with British officials, as Royal Governor of New Jersey. 1765 - First iron furnaces are built in the Pinelands using locally mined bog iron ore, with furnaces later producing cannon balls used in Revolutionary War. 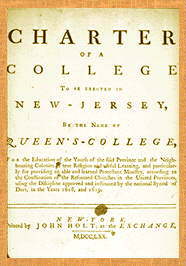 1766 - Governor Franklin signs charter for Queen's College (later Rutgers University), founded to counter Presbyterian influence of College of New Jersey. 1774 - The Greenwich Tea Burning takes place in Cumberland County on evening of December 22, when forty townspeople disguised as Native Americans seize cargo of tea imported from Britain by East India Tea Company hidden in cellar of home of a Loyalist, and carry tea bales to adjoining field where they are set aflame. 1775 - On October 9, the Continental Congress authorizes formation of two military regiments from New Jersey: the First New Jersey Regiment, also known as the "Jersey Blues" from the name adopted during the French and Indian War, and the Second New Jersey, whose soldiers primarily came from the western counties of provincial New Jersey. 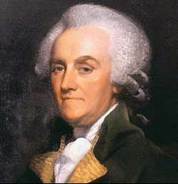 1776 - In January, Royal Governor William Franklin is placed under house arrest by colonial militiamen, later jailed and released to British in prisoner exchange, spends much of War in Connecticut and New York with Loyalists seeking to aid British armies. At end of War, departs for England where he works as agent attempting to gain compensation for seizures of Loyalist assets, largely disinherited by father. - New Jersey adopts its first state constitution on July 2, and on August 31 elects William Livingston as first governor of the new state. - Declaration of Independence is adopted on July 4 in Independence Hall in Philadelphia. New Jersey delegates who later sign the document are Richard Stockton, Abraham Clark, John Hart, Francis Hopkinson and John Witherspoon. - In September, Benjamin Franklin and John Adams, designated by Continental Congress to discuss potential armistice with British, share a room in New Brunswick on their way to Perth Amboy, where they embark to Staten Island to meet with Admiral Lord Howe and his brother General William Howe and conduct unsuccessful talks. 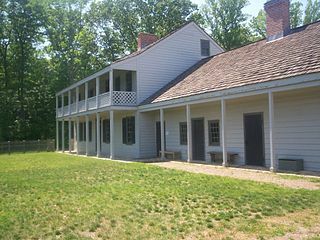 - From November 13-21, George Washington makes his headquarters at the home of Peter Zabriskie in Hackensack, with his army encamped at Fort Lee. On November 20, British and Hessian forces under General Cornwallis cross the Hudson River from New York to invade New Jersey, with American troops abandoning their positions at Fort Lee and retreating across New Jersey into Pennsylvania. - On night of December 25, Washington crosses the Delaware River from Pennsylvania to Trenton, killing or wounding over 100 Hessian mercenaries and capturing 900 more. The victory helps Washington convince his soldiers to extend the length of their service beyond the end of the year. 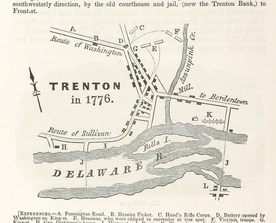 1777 - On January 2, in the Battle of the Assunpink Creek, Washington's forces successfully defend their position in Trenton against repeated assaults by the British commanded by Lieutenant General Cornwallis. At night, Washington abandons the position and moves his army around Cornwallis to march north, where he gains another victory on the next day over British regiments commanded by Lieutenant Colonel Mawhood in the Battle of Princeton. Before Washington arrives in Princeton, Continental General Hugh Mercer is injured in a British bayonet assault, dying later on January 12 in a house on the battlefield where he had been carried. Mercer is later memorialized through the naming of the County of Mercer. - From January 29 to March 18, and again in May and September, the General Assembly meets at the Indian King Tavern in Haddonfield to avoid security risks from potential British raids at more northern sites. While meeting at the tavern, the Declaration of Independence is officially ratified; the Great Seal of the State is adopted; and the word "state" is substituted for "colony" in all official acts. - On June 26, Washington's forces of some 6,000 men engage in the Battle of the Short Hills, a series of skirmishes on the plains below the Watchung Mountains with the combined British and Hessian troops numbering 12,000 under the command of General William Howe. - Battle of Gloucester, the first battlefield command of the Marquis de Lafayette, is fought on November 25, with 400 soldiers under Lafayette attacking the British, killing about 20 and taking 20 prisoners. 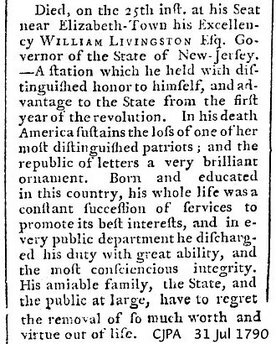 - On December 5, the New Jersey Gazette, a weekly newspaper printed in Burlington with the support of the General Assembly and Governor Livingston to advance the patriot cause, begins publication. 1778 - Continental General Anthony Wayne and Polish Count Casimir Pulaski skirmish on March 2 with British forces under Major John Simcoe at Cooper's Ferry on the Delaware River, driving Simcoe to evacuate New Jersey for Philadelphia. - At the Battle of Monmouth on June 28, Continental Major General Charles Lee fails to follow Washington's orders to attack the British Army under Lieutenant General Sir Henry Clinton. As Lee retreats, Washington encounters him, reportedly cursing 'You damned poltroon [chicken]!" Washington rallies the troops and the resulting battle results in a standoff. 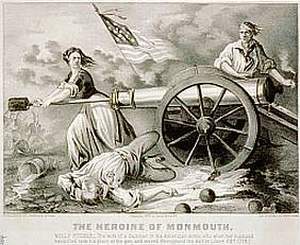 The battle is also known for the role of Mary Ludwig Hays or "Molly Pitcher," the wife of a Continental soldier who was said to have repeatedly carried buckets of water to the soldiers in the intense heat and taken up her husband's place at a cannon after he collapsed from his wounds. - On July 2 at New Brunswick, General Lee is convicted at a court martial for insubordination at the Battle of Monmouth in disobeying Washington's orders and expressing disrespect to his commander. He is sentenced to loss of command for one year. - Battle of Chestnut Neck takes place on October 6 after General Sir Henry Clinton in command of British forces at New York City sends nine ships with 300 British regulars and 100 Jersey Loyalists to attack privateers who had seized ships with supplies intended for British military. The soldiers land at Egg Harbor, but their plans to continue up the Mullica River to destroy the ironworks at Batsto are abandoned when Governor William Livingston dispatches riders to warn local residents of the impending attack, allowing time for the privateers to sail out to sea and the removal of valuable cargo. - Wallace House in Somerville serves as Washington’s headquarters from December 1778 until June 1779. 1779 - On August 19, Major Henry "Light Horse Harry" Lee leads 300 cavalry soldiers in an attack on the fort held by the British in the Battle of Paulus Hook in Jersey City, succeeding in taking 158 prisoners, but declining to destroy and occupy the fort since it housed wounded British soldiers and wives and children. Lee withdraws, skirmishing with pursuing British soldiers as he escapes to Hackensack. - Washington establishes headquarters at Ford Mansion in Morristown, with his troops encamped at nearby Jockey Hollow during the winter of 1779-80. - On December 23, the court martial of General Benedict Arnold re-convenes at Morristown, with Arnold cleared of most charges of misusing government wagons and illegally buying and selling goods. He is reprimanded, however, and his resentment over his treatment contributes to his treason in the next year, when he conspires with the British in planning to allow them to capture West Point. 1780 - On January 25, British troops raid Elizabethtown, burning the Presbyterian church, Academy, and courthouse and on the same night, other British troops raid Newark, burning the Newark Academy. - Washington resides off and on for three months at the manor home of Dutch-born Dirck Dey in what is now mostly Wayne. - British and Hessian troops raid Hackensack on March 23, burning the courthouse and jail. - In an attempted advance to attack Washington at Morristown, some 5,000 British and Hessian soldiers are turned back on June 23 by 1,500 Continentals in the Battle of Springfield. 1781 - At the end of August, Washington is headquartered at Chatham, with nearby French troops under Count de Rochambeau camped at Liberty Corner. The two forces march south, joining at Princeton where they continue on to confront Lord Cornwallis in Virginia. - On October 19, Cornwallis surrenders at Yorktown. 1782 - Joshua Huddy, a captain of the Monmouth County militia who was accused of summary raids and hangings of local Loyalists, is hanged in Highlands on April 12 by Loyalists who had taken him from the custody of British soldiers. In an attempt to prevent independent reprisals by the New Jersey militia, Washington agrees to allow selection by lot of a British prisoner for hanging in retribution for Huddy's execution. The prisoner selected, Captain Charles Asgill, is later spared, however, after the French intervened to request his release and he was freed by order of the Continental Congress passed on November 7, 1782. 1783 - Princeton serves as the nation's capital from June to November when Congress relocates from Philadelphia over concerns of possible violence by Continental soldiers protesting over back pay and future pension commitments. Congress is in session in Princeton when it receives notice on October 31 that the Treaty of Paris ending the War had been signed on September 3. 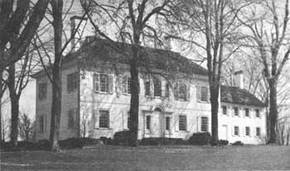 - Washington writes his Farewell Orders to the Armies of the United States in October while staying just north of Princeton at Rockingham, the Rocky Hill farmhouse of Margaret Berrien, the widow of a prominent judge. 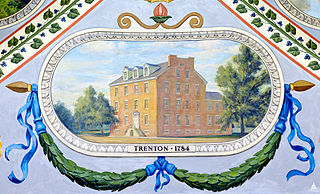 1784 - Trenton serves as the nation's capital from November 1 to December 24 as the Congress meets at the French Arms Tavern, then Trenton’s largest building. On December 11, the Marquis de Lafayette delivers his farewell address to the Congress at the Tavern before his return to France. Initial plans are made for construction of a permanent US capitol building after Congress approves a plan to have Trenton and Annapolis, Maryland, each alternate as the national capital. The plans are abandoned, however, after objections by George Washington and leaders of southern states resulting in Congress selecting the site which would become Washington, D.C., as the permanent capital in 1790. 1786 - The Horsehead Copper, the first coin in the nation to use the motto "E Pluribus Unum" (Latin for "Out of many one"), is minted in Rahway. 1787 - At the Constitutional Convention in Philadelphia, New Jersey delegate William Paterson introduces on June 15 the "New Jersey Plan" for a single-house legislature with one vote per state. The plan is submitted in response to the "Virginia Plan," which proposed a two-house legislature with representation in each house based on population. The eventual compromise resulted in the Senate with two members per state and the House of Representatives apportioned on the basis of population. - In addition to Paterson and Governor Livingston, the other New Jersey delegates to the Constitutional Convention who sign the document on September 17 are David Brearly, Jonathan Dayton and William Houston. 1788 - In the first election under the new US Constitution, New Jersey legislature elects William Paterson and Jonathan Elmer, a physician from Bridgeton and the Cumberland county surrogate, to the US Senate. 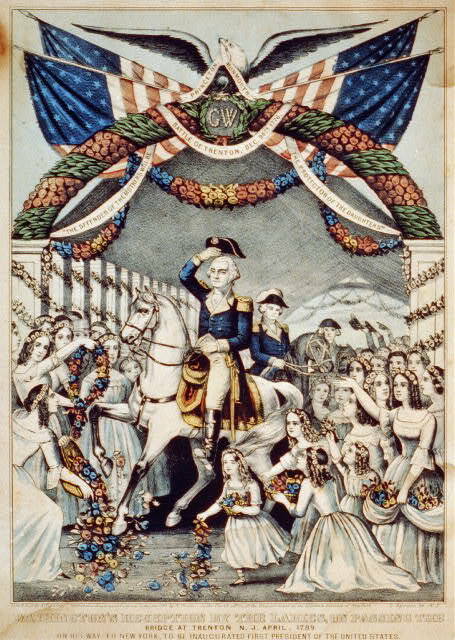 1789 - On his way to his inauguration as president in New York, President-elect Washington receives a triumphal greeting in Trenton and spends the night of April 22 at the Cross Keys Tavern in Woodbridge. When he reaches Elizabethtown on the next day, he boards a specially built ceremonial barge which takes him across the river to Manhattan. - On November 20, New Jersey becomes the first state to ratify the Bill of Rights. 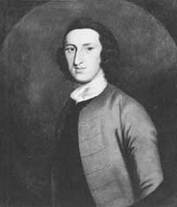 1790 - Governor William Livingston dies on July 25 at his home of Liberty Hall in Elizabethtown. He is succeeded by William Paterson, who serves until 1793 when he accepts appointment by President Washington as an associate justice of the US Supreme Court. - In the first US Census, the New Jersey population is reported as 184,139, including 11,423 slaves, of the total US population of 3,893,635 persons. - Frederick Frelinghuysen, who served under George Washington as an officer in the Revolutionary War, is appointed by President Washington as a brigadier general for the army's campaign against the western Indian tribes. He subsequently serves in the US Senate from 1793 to 1796, while also being a major general in the New Jersey militia in 1794 during the Whiskey Rebellion. 1791 - Secretary of Treasury Alexander Hamilton is one of co-founders of Society for Establishing Useful Manufactures chartered by state to build nation's first planned industrial city, using power generated by the Great Falls of the Passaic River. In following year, Society purchases 700 acres above and below the Great Falls and establishes city of Paterson, named for Governor Paterson, who had signed Society's charter. 1796 - On February 22, the Assembly passes “An Act to regulate the Election of Members of the Legislative-Council and the General Assembly, Sheriffs and Coroners, in this State,” which specifically included women as eligible to vote, thus clarifying the provision in the 1776 Constitution which stated that "all inhabitants" could vote. 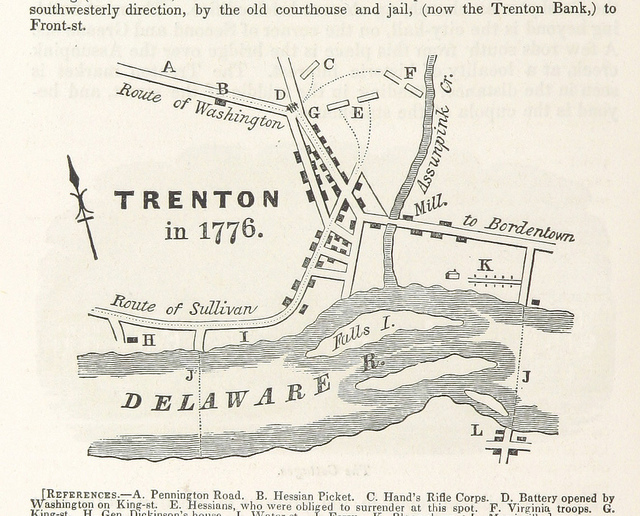 1798 - New Jersey legislature enacts legislation incorporating initial group of 104 townships.